My Take on it – I have been hearing rave reviews about this movie and the book this was adapted from for months and have been interested in seeing whether this is really that good. On one level this movie is about a mother-son bond that is stronger than anything else. It’s rare to see such strong performances as the ones presented here. The second theme of this movie is the way one can keep hope alive in a seemingly desperate situation. I loved the way that much of this film is told entirely from an innocent 5 year old’s perspective. We get to experience things for the first time just like him because everything in those scenes are solely what he sees, hears and understands (and sometimes even shot from his height to really get us to feel like him. 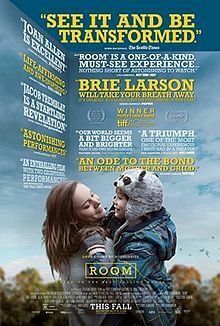 Much has been said about why Jacob Trembley has been placed on most award ballots in the supporting category instead of lead and the simple answer is that history has proven time and again that children fair much better chances in award races in supporting roles as opposed to lead and this placement, although inaccurate is meant to give him a better chance at winning awards for this amazing performance. This movie is held together beautifully by its two leads who give their all. Due to the difficult nature of the premise, I’m not quite sure how interested I will be in seeing this again so soon, but it by all means is worth seeing by one and all. Bottom Line – Great story about a mother-son bond that is also a tale of hope in desperate situations. I really like how so much is seen from the innocent view of Jack and we mostly only see and hear things from his perspective. It’s especially wondrous to see him encounter new things because we also feel like we are experiencing them for the first time also. Excellent performances all around that will be lauded many awards in the near future to add to what they already have won.. Highly recommended! So very emotional. Yet, worked so well, too. Nice review. Tnx Dan. Always appreciate u stopping by and commenting!